Having heard of numerous positive reviews about the Asus Zenbook, I received the review unit with great expectations. The Zenbook is one of the first Ultrabooks launched in the market. The name “Ultrabook” is trademarked by Intel and describes laptops that are lightweight, high performance and with long battery life. Zenbook, shown here with the free sleeve case. 1. Full aluminium body with ultrathin profile. The brushed metal surface feels more durable and less prone to scratches than Macbook Air. There are ample wrist rest for typing and the large trackpad is very much appreciated. 2. 2-second instant-on with Super Hybrid Engine II. Yes, the bootup and shutdown times are just as fast, but any computer running on solid-state storage drives (SSD) could achieve that. But the instant-on feature is just impressive. Not only that, but putting the Zenbook to sleep does not use up a lot of battery power. 3. Higher screen resolution at 1600×900. It’s the highest resolution Ultrabook, which means your display will look sharp and you can see more rows and columns of your spreadsheet applications, or scroll less to see your Facebook feeds. The gloss screen surface has a good balance of reflectivity. 4. Effective Battery Management. Zenbook comes with its own Asus Power4Gear Hybrid battery management app to make sure you get maximum battery if you need it. For each usage profie, you can specify the maximum processor speed, which is good. 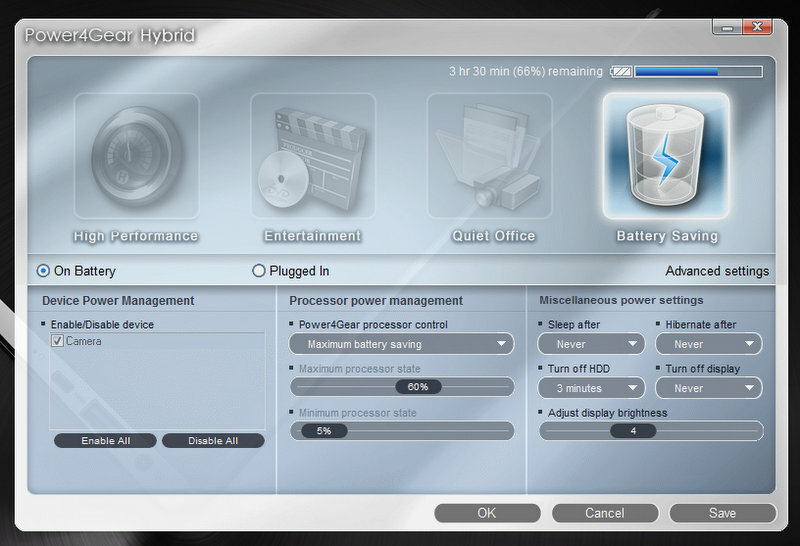 When I turn on Battery Saving mode, the laptop runs in low heat. I also like that the Zenbook does not heat up when charging. As for battery life, well, it depends on the applications. If you turn on High Performance, the full charge would barely last 4 hours. When running on Battery Saving mode and doing casual computing, the Zenbook can offer realistically 5-6 hours. Coupled with instant-on and sleep, you should be able to get through the day. 5. Audio speakers. Running on Bang & Olufsen ICEpower, the Zenbook is pleasant to listen to. You get crystal clear treble, well-delivered mid-range, and light bass. There are minimal audio distortions, prevented by audio limiter. The stereo sound permeates through the keyboard surface, giving you unblocked listening experience. But occasionally some songs with certain audio frequencies may rattle the keys. Nevertheless, I am impressed with the sound. 6. Bundled accessories. Zenbook retail package comes with adapters for VGA (D-Sub) and LAN (RJ45 Ethernet port), so that these chunky ports do not clutter the interface, and consumers can still connect to VGA and Ethernet. A premium laptop case is also included, which completes the ownership. It is to be noted that the mini VGA port on the Zenbook is proprietary and is not the standard mini DisplayPort as mentioned by several online review sites. Despite the sleek design, thoughtful apps, and bundled accessories, I find the actual usage experience rather disappointing. Let me explain why. 1. Keyboard. It might look good, but it doesn’t work quite good. Due to the shallow key action, there is a high tendency of missing key strokes, but if you alter your keyboard habits, like hitting the keys a little harder, you might be able to increase the hit rate. There is also no keyboard backlight if your life depends on it. So, tough luck working in a dark environment, although perhaps the ultra-bright LCD screen (450 nits) could offer some illumination. 2. Trackpad. After experiencing the Macbook trackpad, no other Windows-based laptop comes close, including the Zenbook. The response is laggy and multi-touch gestures are frustrating to use. Use an external mouse to get more consistent results. 3. Wi-Fi connection. The most disappointing feature (or lack of) is the Wi-Fi radio. The connection consistently drops, indicated with a yellow exclaimation icon next to the Wi-Fi status, showing “No Internet Access”. A search on google reveals that the short term workaround is to set the power profile to “High Performance”. Sadly, this means the battery will drain faster and the Zenbook will get hotter. Hopefully this problem can be fixed by software updates. The Asus Zenbook delivers a great impression with sleek design, custom applications and user interface. The instant on and sleep means you can use the Zenbook whenever and wherever you need it without worrying about long wake-up times, battery drain and ensuring proper shutdown. The laptop generally runs smoothly and extremely quiet. The major annoying issue is the persistent dropped Wi-Fi connection. But like what I tell my peers who spend too much time evaluating and waiting for the perfect gadget: “Don’t forgo the benefits because of a few weaknesses.” If you simply must have the 2-second instant-on feature, then no other laptop can beat the Asus Zenbook – for now. Hi there, how much does your UX31 cost in Singapore? I'm going to buy one for myself in the next couple of weeks when I come to Singapore! Great review! Hi, the review unit is selling at a recommended price of S$1498.